Comic Vine have unveiled a new preview of Batman #43, out next week, which picks up the trail of Jim Gordon, trying to stop a mysterious new villain in Gotham called Mr. Bloom, as he hunts down rumors of a very-much-alive Bruce Wayne (something readers themselves knew was the case in Batman #42. That’s right, Bruce Wayne’s death lasted a grand total of 1 issue, which may just be a record for least-permanent major comic death). I mean, at least it’s a twist on the usual recently-resurrected hero who usually just waltzes back into their old identity, but it looks like Jim’s going to be staying as Batman for much longer, even with Bruce Wayne kicking it around helping out the kids of Gotham. Yeah, now even Superman is hanging around pining for the old Bruce Wayne to come back. Are we just going to see a queue of DC’s finest hang out outside this Youth Center, all-puppy-dog eyes before Bruce Wayne goes “fine, fine god dammit somebody get me a batsuit”? Actually, I kind of hope so. That would be great. 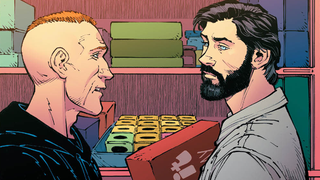 Batman #43 will be out next week—head on over to Comic Vine at the link below to see a few more preview pages. *Until he’s not, because yo, there’s a certain movie out and everything.